Your accommodation is in a new but traditional Andalucian cortijo (farmhouse) named El Cazador (The Hunter), set high upon a promontory within the 11 acres of Finca Los Tigres, a stone’s throw away from Hípica Aguamarga’s stables. It is a stunning, spacious and luxurious villa, with an enticing mix of the modern and the traditional. It has a pool of 13m x 3.5m and terraces on 3 sides of the house. 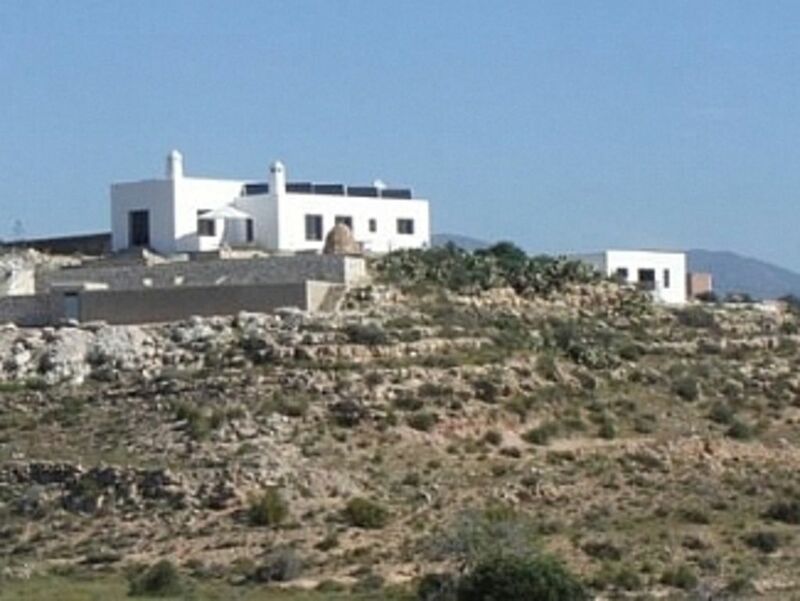 El Cazador, a 3-bedroom, TV room, 2- bathroom whitewashed cortijo, can comfortably accommodate 6 people in its 144 sq.m. It is an enticing mix of the traditional and the modern, with terracotta tiles on the floors, slate terraces and underfloor solar/gas heating. Every effort has been made to render the house ecologically friendly, using double glazing and double walls with insulation to keep out the heat in summer and lock it in during the winter. We even placed the windows in accordance with the angle of the sun rays to allow more light in winter and less in summer. Finca los Tigres is Far from the Concrete Jungle. The main wow factor is the stunning views combined wih the audible silence. Our guests all comment on the views and the silence, which is enhanced by the muted sounds of birds, cicadas and other little critters. The sunsets are spectacular because guests can sit on the terrace and not see anything but nature between them and the setting sun. The pool shimmers in the twilight. Some horses whinney in the distance. Life is good. The Finca is not close to a ski resort but we find the 2 hour drive to the Sierra Nevada Olympic Ski Area near Granada not very exacting, using the brand new freeway via Guadix. You can go up one day, then come back the next and thus ski and swim in the Med on the same day! Notes on accommodation: Solar powered underfloor heating keeps the property aired all year round. An air conditioning unit is provided, but seldom needed because the property is built using ecological principles, with double walls, angled shade etc. The property is not suitable for those who have difficulty walking. Small children need to be supervised. Pets are welcome but cannot be fenced in. Outside: The pool is 13m x 3.5m. It is solar heated (temperature varies) and entirely private. The barbecue is situated on a lower terrace, overlooking the pool: you can cook steaks while keeping an eye on your children in the pool! There are 6 high quality loungers and 12 garden chairs for use on the various terraces, as well as a double hammock. Throughout the terraces you will find pergolas and parasols for the necessary shade. Cleaning / Towels / Linen / Maid service: All linen, towels and other amenities are included. Cleaning before and after occupation is included in the price. Guests are able to wash linen during their stay; washer, dryer, washing and softening liquids are provided. Other: The bedrooms are furnished to a high standard, with comfortable beds and superior bed linen (included). Perfect location for two over-worked people to find balance and recovery :-). We enjoyed the silence and the nature around the finca. Hiking, mountain biking and riding (Hipica Agua Amarga) can be done directly from the Finca. The landscape is fantastic! The Finca Los Tigres is also a perfect point from which to plan one-day trips. (For example Granada/ Alhambra 2h one way by car) . The distance to the next bigger city Almeria is perfect (30 min by car). Shopping for you daily needs can be done in the supermarket in Carboneras (15 min by car). We have been already 2 times in Finca Los Tigres and for sure will come back again! Thank you so much for your lovely review of our Finca. It is great to hear from our returning guests because they will let us know what is good and what can be improved! You are always very welcome: we look forward to seeing you again at the Finca! Superb accomodation in stunning scenery! We arrived late after a long journey and we were surprised by a wonderful basket full of first necessities for breakfast next morning, very thoughtful! The local manager was very hospitable and made us familiar with the premises. The accomodation is impeccable clean and the kitchen and bathroom are supplied with everything you need. After a good nights rest in luxurious beds we enjoyed our breakfast on one the terraces with stunning views over the valley with horses grazing their own breakfast! Although the accomodation is self catering , our stay felt as if we were staying in a 4* hotel because of the complete and luxurious decor and the wonderful private infinity pool. We'd love to return and we'd surely recommend this accomodation to everyone! Dear Mrs Muhring, thank you so much for your kind words! When you return we will do our very best to top your previous experience! The nearest big town of Carbonaras, with its market, bars, restaurants and splendid beaches is a absolute Spanish delight and we loved Agua Amarga for its simplicity, warm welcome, nice beach and good food. Thank you so much for your splendid review of our Finca. We are very happy that you found our place to your liking and we hope to welcome you back on many more occasions! This is a roomy, calm, comfortable house which is very well equipped (and with Wolfgang on hand for emergencies or advice). The pool is deep enough to proper swimming and the outlook from the verandah is superb - rugged hills rolling over to the sea. The nearest seaside village of Agua Amarga is a quick hop by car though we often walked. It has quirky shops and simple restaurants. We loved walking from the house to a couple of deserted coves with brilliant swimming. Further afield, the hills and villages of Cabo de Gato are a delight. We shall return! Finca Los Tigres is affiliated with our neighbour's stables called Hipica Aguamarga. We provide riding for the entire family. Our horses will take you to the beach or the nearby villages. Or maybe you would like a lesson in the Picadero. Your children would love our small but sturdy and very friendly ponies, and if you like to muck in, Martha would be most grateful for your help! The Finca is 5 mins drive from Aguamarga Beach. Sailing opportunities abound for visitors of all experience, whether just for fun or if you are looking for something more ‘intense’. It is possible to hire motor boats, catamarans and Hobie Cats in Agua Amarga. Further away by horse, boat or or 4x4 are Plomo, Enmedio and Playa del Muertos beaches, the latter requires a hike of 20 mins. A car is essential in Agua Amarga because there is no public transport. Agua Amarga: 5 mins by car. Carboneras (market town): 10 mins by car. Almeria: 45 mins by car. All amenities can be found in Carboneras, our local market town. The market is on Thursday, from 0900-1300 hours.